Akinwumi Ambode, governor of Lagos, says the state will have its first female governor in no distant time. Ambode made this statement on Wednesday when he received Zuffon Bukola, an SS2 student who became one-day governor of the state after winning the annual Spelling Bee competition. In a statement shared with TheCable, Ambode said the emergence of two female students as one-day governor and deputy was a sign of what the future holds for the state. “This is a significant day for Lagos state and it also signals what the future actually holds for Lagos State in which we have seated here, two female strong members of the new state executive council and we have a female governor and a female deputy governor,” the statement signed by Habib Aruna, chief press secretary, read. “We’ve had female deputy governors in this state; it also says something that these younger ones are telling our women in Lagos to rise up and actually take their position. 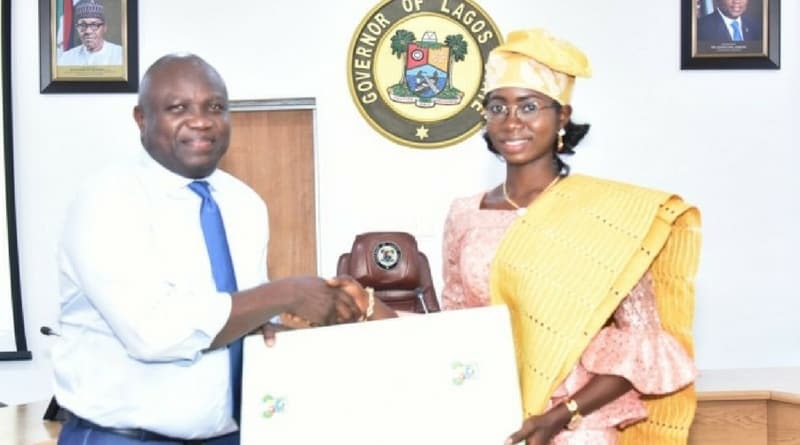 Ambode also awarded a full scholarship to the one-day governor and her deputy, Rosemary Ogidan, while also announcing a cash donation of N1 million each to them. He also gave a cash donation of N500, 000 each to members of their one-day cabinet. The Spelling Bee competition was introduced by Oluremi Tinubu in 2000 when she was the first lady of the state.